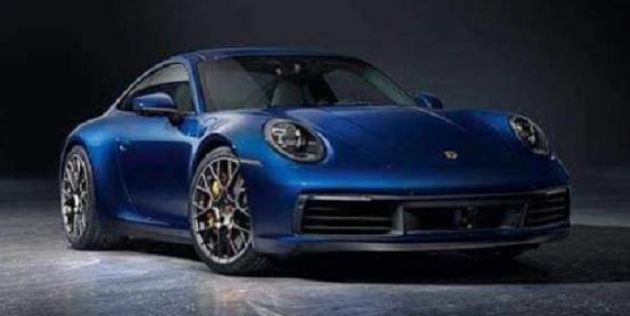 Just a few days after Porsche began teasing the arrival of its all-new 911, leaked official photos of the 992-generation model have made their way onto the internet. If you’ve seen any spyshots of the upcoming sports car leading up to this point, what you’re about to see won’t be much of a surprise. The iconic silhouette is still present, but the front and rear ends have been totally redone. In the case of the former, the bumper now sports rectangular-shaped intakes in the corners as opposed to the trapezoidal ones on the 991.2-gen car. Other cues seen at the front include round headlamps with four-point LED daytime running lights within them, and the middle section prominently houses the sensors for the car’s safety and driver assist systems. Moving to the rear, the 911 takes inspiration from its siblings with its taillights that are connected by a an illuminated light strip. Elsewhere, the clusters themselves are shaped smaller than those on the outgoing model, and the dual exhaust outlets are separated further from one another within a redesigned lower apron that better integrates the air outlets and reflector/fog lamps. No shots of the interior, but previous spyshots reveal the 911 will mimic its other siblings by way of displays for the instrument cluster and infotainment system on the main dash. There’s also new switchgear, gearshift levers, steering wheel design and climate control unit inside. In keeping with 911 tradition, the engine will continue to sit on the rear axle, with both rear-wheel and all-wheel drive layouts being offered. A turbocharged flat-six engine is to be expected, with a choice of an eight-speed PDK dual-clutch automatic in lieu of the current seven-speed unit – a seven-speed manual has also been cited. Wake up! Stop dreaming ah boy, go do your homework! Same old same old body design, just tweak here and there and call it a day. I guess Porsches are for the purists and collectors. Porsche can’t really redesign the 911 since it has such an iconic shape and design. Doing so will surely piss off the 911 fans and purists as you said. I need one in my life…..